What does shown mean? Most floral items on our web site have 3 prices, a low price, a shown price, and a high price. The shown price is the price of the item as pictured on the web site. 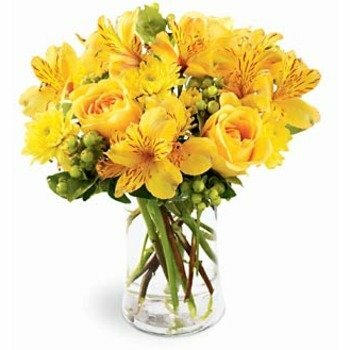 If you select the higher or lower price, you will receive a very similarly styled arrangement, but the number or types of flowers will vary to reflect the different price selected. Such a happy bouquet -- it's practically begging to be shared! It is ready to bring sunny wishes into any home. Send for any occasion (or no occasion at all) and watch the smiles happen. Order online now to take advantage of our low service fee, or place your order by phone at (800) 266-0452 (outside the U.S. (225) 927-1062). A $14.95 service fee ? will be added to the price of the arrangement when ordering online. The service fee added to the price of the arrangement is $18.90 when ordering by phone. What is the service fee? Most items on our web site have either a service fee, delivery fee, or shipping and handling fee. This charge covers the processing and/or delivery of your order, and unlike many of our competitors, we don't charge extra for same day delivery or delivery at holidays. Same day delivery is available for orders submitted before 1:00 PM in the recipient's time zone Monday - Friday, and 11 AM Saturday. Delivery is not available on Sundays. * Excellent service, no worries. * 1ST in flowers is my go to site for flowers. I have never been disappointed with their quality, price and delivery. You may find this translation tool helpful if you have found us searching for flores, floreria, florista or floristeria in Spanish or for fleurs, fleuriste or livraison fleurs in French or for blumen, blumenladen or blumenversand in German. International customers are very welcome at 1st in Flowers! Copyright © 1995 - 2019 1st in Flowers!, LLC. All rights reserved.